The weather in North Carolina is notoriously extreme. 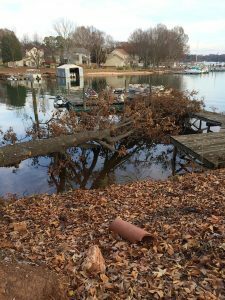 From hurricanes, flooding, the rare ice storm and even tornados, depending on the year, Mooresville can take a beating. The casualties of these weather events are generally, our healthy population of trees. This can create major issues down the road for your trees. When the spring storms start to rumble through the area, it is critical that you have a company you can count on for, fast and safe, storm damage clean up. Tree Tech Tree Service are your local storm damage cleanup experts. We are committed to making your property safe following an event that has damaged or toppled your trees. The true problem with storm damaged tree debris is the fact that, if severe enough, it can cause even more damage down the road. Branches can come crashing down and damage your home or other buildings, it seems that every year we hear about a car that has been smashed by a toppled tree or a large falling branch. What if your tree has shed a massive branch into your yard and you need to get rid of it fast? Call the experts at Tree Tech Tree Service! It can be quite dangerous to remove a large branch or storm debris and that is why you should always rely on the experts for your storm debris removal. We will minimize the risk to your home, your property and most importantly, your family. Whether it is a spring shower, a winter ice storm or a summer thunderstorm, Tree Tech Tree Services is your number one, local storm debris removal company. We also maintain storm damaged trees, bringing them back to health and creating a safe environment for you and your family. Be sure and contact us today with any questions you may have about storm debris removal or keeping your trees healthy. We look forward to hearing from you!